A pneumatic wedger/corer with dual cylinders that can both wedge and core in one swift movement. To operate: Open the clear Lexan door, place apples under pushers, close door. 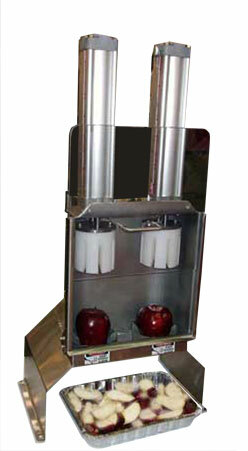 Door closing automatically activates the dual air cylinders, pushing the apples through the core/wedging blades giving you perfect cored and wedged apples every time. Door automatically opens for faster processing time. Available in 4, 6, 8, 10, 12 wedging blades. Includes two 8 wedge or 12 wedge blades and pushers.